I feel that there are some excellent points here. Years ago I heard the comedian Steve Martin, he said, "I have taken up joggling, and people ask me, 'Steve, how do you have time for joggling' , and I answered them 'I joggle in my mind'". Now while that might be comedy there is a point. As Hal points out, of course we need physical training, hands-on training, and we must build muscle memory. But this mental training, this visualization adds a great deal. I will add something that perhaps Hal did not know; this technique has been used by rabbis and Talmudic students for centuries. We believe that every moment God gives us is a gift, time not to be squandered. As such we have the concept known as "Bitul Zman" which means a wasting of time. Bitul Zman is more than just a waste of time, such as when you are being delayed by a government bureaucrat, it refers to the act of knowingly wasting time when you have a way to make use of that time. That means if you are stuck in traffic, do not waste that time, use it to study, or to train, in your mind. Yes, mental training, visualization. I can spot it. See a rabbi who looks like his head is in the clouds? well, it is. He is engaged in a brilliant Talmudic debate with other scholars, some of whom may have passed away centuries ago. He is in a heated debate of "Shakla we Tarya" (Back and Forth), he is in an active battle fighting for the truth. Now apply that to our Krav Maga training. As Hal said, visualize an attack. now we have our Talmudic debate, that Give and Take, the Shakla We Tarya; he attacks me from this angle, I respond as such. We visualize violent situations so that when, God forbid, they appear, we have "Been there, done that" already. We are prepared. The greatest challenge is not learning the techniques, no, it is the applying f them and not be frozen by the initial shock of the attack. That initial shock is the killer, that is where the vast majority of people die. The visualization helps prepare for sudden violence. As Hal points out visualizing the technique is important, and an effective way to enhance our mental muscle memory. And as he points out it trains us for "seeing" in advance real situations. Now here is an important point: While techniques can be trained in the dojo (training hall), and while we can also have Scenario training where we reenact or anticipate actual violent situations, we cannot cover all possible situations. However, with the visualization we can. You are in an airport, a train station, visualize a possible attack, that is how a soldier thinks, imagine an attack while waiting for your luggage, imagine an attack as you enter the restroom. Visualization at times can do more than actual training. it is the missing peace. Thanks Hal for bringing up this important point. To most students this will appear to be somewhat of a scam or just empty rhetoric. It actually is neither. Then, if one does a little research and/or has experience with having taken the concept seriously things can and usually do change….. I have seen and read interviews with a number of extremely good professional athletes regarding visualization. The vast majority of these (the ones who stand out) say emphatically that visualizing their activities, drills, movements, etc. is often nearly as effective as performing them physically. Certainly nothing can fully replace what many call “muscle memory” but one has to remember that a good bit of even this comes from the brain. Muscles don’t just activate or act or react on their own, no matter what you think. They are controlled at least indirectly, if not directly by your brain. So….If you begin to learn how to do, let’s say, a gun defense or something similar, we all know that repetition (repetition done correctly) is the key. For most students there really isn’t enough time to physically repeat every defense or technique they are learning (old rule of thumb is 500 to 1,000 times or more) to the point where that technique becomes mostly instinct. You can, believe it or not, visualize really bad situations that “might” or “could” happen….Maybe a holdup somewhere, a car jacking, a physical threat and attack by a gang member or even a multiple attacker situation. Fact is that most students have the distraction of jobs, families and other non-self defense situations, all of which limit the amount of time they can spend in a supervised or monitored training environment. Personally, during my early martial arts training days I often mentally practiced (visualized) our “one step” drills and a large array of other basic techniques, mentally trying to break down the physical mechanics and then tie them together as one continuous series of movements, etc. It worked quite well. Although I am, by profession, an architect and am very visually oriented I sincerely believe that virtually anyone can do this to one extent or another but it does take focus. Sometimes when you are having trouble going to sleep this sort of exercise works quite well because you are relaxed. Some people also do this while jogging, etc. On a much more personal note (for emphasis) I will share another example….This is not one of self defense in the ‘normal’ martial arts sort of vernacular but it was in fact self defense in a rather large way….Once upon a time (actually back in the early 70’s, I think) I rode motorcycles a good bit. Knowing that car drivers don’t much look out for bikers and/or would like to eliminate them, I frequently visualized getting into a very bad, tight situation and having to “bail out” (i.e., drop the bike, get off and avoid what might be inevitable death or major injury). I did this off and on for a number of years. As you can imagine, physically practicing this would be rather painful and repairs on the machine in that case would get expensive, etc. Bottom line is this: I was in Brussels on a good sized motorcycle, both on business and touring some of Europe in my spare time. On the way to a meeting I was following a friend on a very rainy day in a lot of traffic. We were cruising at around 35 mph, maybe a bit more, when suddenly the car in front of him stopped, he just barely avoided crashing into that car damaging it and his (new) car severely. On the bike, even with both the rear brake and the front hand brake it was blatantly obvious that I was going to slide into his rear bumper and probably totally destroy my knee in the process. With absolutely no forethought, I locked up both brakes, angled the bike to just miss his bumper (by maybe ½ inch), downshifted, glanced behind for traffic (fortunately there was none), dropped the bike and bailed out with a bit of a roll. With the wet pavement and dynamics the process probably only took about 2or 3 seconds. As I got up and started to pick up the bike, the car that was previously directly behind me crashed into my friend’s car, literally driving its trunk up into the back seat….Never hit her brakes….Had I not bailed out instinctively I would have undoubtedly been totally crushed between them. Ironically the bike was just a bit scratched and no other damage…same for me. I will admit that after the police left and we started back on our route I did start shaking a bit…Maybe a mild form of PTSD? I look back at this in two ways….one, it just wasn’t my time (yes, I’m a bit of a fatalist) and two, had I not visualized doing what I ended up instinctively doing things would likely have been quite different….There was literally no time to think. I’ll never know for sure but I have been totally convinced and still am that the periodic (often frequent) visualization of an event like the one described saved my life. Consequently I still visualize every chance I get in order to hopefully be better able to execute self defense techniques and, perhaps more importantly, to better understand them so that I can teach them more productively to others. If you are a beginner, this is a great way to start. 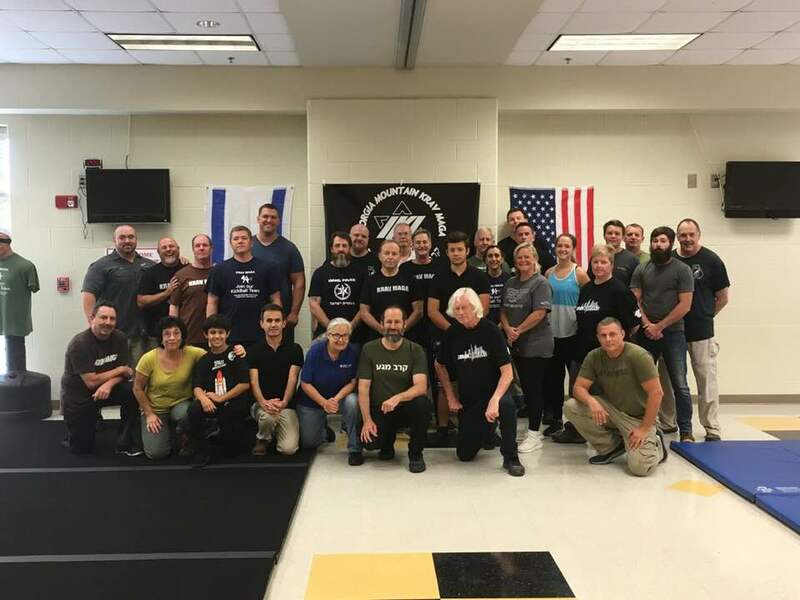 If you are an instructor, this is a great way to stay on top of the latest developments in Krav Maga in Israel and around the world. On a daily basis you will receive short video clips. updates on new techniques, new situations and our constant improvements drawn out from real life experience and a study of crime world wide. You can send in questions, ask about any situation, send videos of real crime and ask for solutions. You can send in video clips of yourself for evaluation. You can test for rank.